Grove Creek Farm is located in the Piedmont region of Georgia. We are dedicated to the preservation of agrarian landscapes and lifeways. Our philosophy is that we learn from the past to guide us in principles of sustainable living for the future. One of the best ways to preserve heritage agricultural breeds is to use them for their intended purpose, such as meat or hides, oxen or milk. Our mission is to raise grass fed beef and breeding stock to preserve Pineywoods cattle while practicing ecologically sound farming methods. We have received and completed several land improvement grants including the Environmental Quality Incentives Program (EQIP) grant through the Natural Resource Conservation Service (NRCS) . The farm was founded by Robert E. Rhoades, farmer and anthropologist, in 1994 as his personal statement on coming "home" to America after more than 3 decades of serving agriculture internationally. Bob saw the farm like a lifetime painting in which he was creating his personal relationship with the Land. Together with his students and local citizens, they studied the historical ecology of the landscapes by using experimental methods and hands-on learning. Many educational projects were up and running and more were planned as people and ideas flourished on the farm. Unfortunately, in 2010 we lost Dr. Rhoades after a brave fight with pancreatic cancer. The future of the Farm was very important to him, so he left it in the caring hands of his daughter and business partner, Daniella, and his son in law and close friend, James. Over the past four years, working weekends and after hours, they have developed it into a working cattle farm. Following in Bob's footsteps can be a challenge because his dreams were so big, but every day is a new adventure and they are loving every minute. James and Daniella Adams now own and manage both the land and the business of Grove Creek Farm. Like her father, Daniella grew up with agriculture and is excited about spending her future working close to the land. She has a degree in General Horticulture from UGA. After working at a large greenhouse following graduation, she realized her passion for plant propagation could be used in working with Southern heirloom plant varieties. Currently, Dani is finding she is putting her horticulture degree to a lot of use learning to grow the best forages on the Farm's pastures. James, also a horticulturist, started his landscaping business at age 9. He went on to receive two degrees in Landscape Management from Abraham Baldwin Agricultural College and the University of Georgia, where he and Daniella met. They married in 2009, and decided to take on both the Farm and the landscaping business together. James operates all of the equipment on the farm in addition to helping with the cattle, fences, trails, and everything else! One of his favorite tasks is tractor work in the fields, smoothing out years of cotton farming damage, and gently leveling, harrowing and seeding new pasture. Any spare time he has will find him somewhere on the farm playing in the dirt! Daniella is in charge of the Farm's retail meat sales. Currently, we offer many cuts of grassfed Pineywoods beef for sale http://athens.locallygrown.net in Athens, GA. With James' help, she also manages the yearly care cycle of the herd. This includes tasks from monitoring birth of calves to loading grass-fat steers for the processor. Spare time finds her sneaking off to sit in the pasture with this year's newest calves and steal pictures of them being ridiculously cute. In 1992 one of the largest land developers in North Georgia, Mr. Lamar Nash, purchased the farm from Mrs. Sanders whose farmer husband had passed away. Mr. Nash's intended use for the property was a development called "Cherokee Estates", a large subdivision which would have held more than 150 homes. By accident, Bob Rhoades stumbled on the property which already had a blacktop road cut through it in anticipation of the coming construction. He was stunned by the beauty of the property and wondered if it could be purchased before the bulldozers arrived. Still unexplained today, Mr. Nash in the first conversation with Bob Rhoades agreed not only to sell the whole property at a reasonable price but also to finance the loan. The future of the land changed instantly. It became a working classroom for Dr. Rhoades and his students as they began the long process of studying the farm's agrarian history. In 1993, the year of Bob Rhoades's purchase, the land had about 150 acres of woodlands and 150 acres which had been farmed for decades. While cotton was the tradition crop in the 20 th Century, the last crop of significance until the 1970s was soybean. The land was badly eroded and the soils were depleted. The land also contains 15 acres of federally protected wetlands. One large creek borders the property. On the east, is the famous Grove Creek (historically known as Golden Grove Creek) and to the west of the property is the old Devil 's Pond Road. The land is inhabited by many kinds of wildlife, including deer, turkey, beaver, fox, wild pig, and many varieties of snakes and lizards, to mention only a few. A. Paleo-Indian (12,000-10,000 BP). Nomadic groups following large game and relying on collecting of wild plants. By 6000 BP, environmental change and human impact brings extinction of large mammal game (mammoth) and the American Amesolithic@ brought a kind of broad spectrum economy whereby reliance on collecting plants and small game increased. Settlement patterns started to shift to the uplands from the main riverine valleys (Broad and Oconee). People during this time were basically another species in the environment. There only ability to affect large areas would have been by using fire but it is not know the extent of fire=s environmental impact. Unknown if any identifiable paleo-Indian sites on the farm. B. Archaic Period (10,000-2700 BP). Dozens of archeological sites on the farm from this period. Located just above the creeks (water sources). Mainly quartz flint remains, including projectile points. The area between the Broad and Oconee Rivers were occupied by incipient agriculturists who were starting to specialize their economic activities and intensify resource use. The farm has one of the highest locations in the area and was selected by early inhabitants. They were likely drawn to deposits of chert and quartz for stone tool making. The settlements became semi-permanent. Probably Indians came to the farm where they hunted, gathered, make tools, and then returned to more permanent settlements in the Broad River. By 2000 BP the populations was increasing and visits to the farm were more frequent. The functional difference between the river valley and the uplands was becoming less marked. It is possible that groups were splintering off from the Broad River populations and establishing their own upland territories. Abundant water from Golden Grove Creek as well as wood, stone, game made the farm very attractive. By the Late Archaic/Early Woodland (1500BP-2700 BP), the Native American social organization was changing. Villages were more permanent, long-distance trade emerged, and pottery making appears on the farm for the first time. C. Woodland Period (2700 BP-1100BP). This is the beginning of agriculture. Permanent structures, long-distance trade, exotic non-local materials, and a complex culture evolves (mound building, elaborate burials, incipient Chiefdoms). On the farm, however, Indian presence was still in smaller settlements and temporary camps. Later part of this period, the population declines. D. Mississippian Period (1100BP-450BP). Intensive agriculture. Chiefdoms (Oconee assumes power over Broad). Warfare and increased hunting activity (conflict between Savannah and Oconee River area with Broad the boundary). People may have fled into the uplands such as found on the farm. Finally, there are permanent settlements on the farm (a large one where my main cabin is located). They practiced shifting cultivation (maize, squash, beans). The farm was being altered significantly by human occupation. E. Early European Contact (1540AD-1770). Indians of the farm became part of the Creek confederacy with close contact with Cherokee nearby. The Creeks were made of separate, loosely affiliated tribes. Before Indians on farm saw first white man, they were receiving European goods by tread. Hernando de Soto (1540) passed by Green and Taliaferro counties south of Oglethorpe and the farm. Possibly de Soto=s scouting parties arrived in Oglethorpe and the Indians were aware of their presence. It would be decades before other whites appeared but De Soto=s presence would impact the farm=s residence through diseases and a later slave trade. A new era was born as alliances between Europeans and Indians groups took various turns resulting in death, enslavement, and social disruption. By 1700s English traders from the north were making incursions into the area (deerskins for guns, rum, blankets, food, ornaments). F. Later Colonial Period (1770-1793). Colony of Georgia still toward the Broad and Savannah Rivers and the farm was part of the Creek Confederation. Europeans were moving in, however. To relieve debts, the area of all Broad River and Oglethorpe counties were ceded. Settlers from Virginia and Carolinas moved in (headright system). 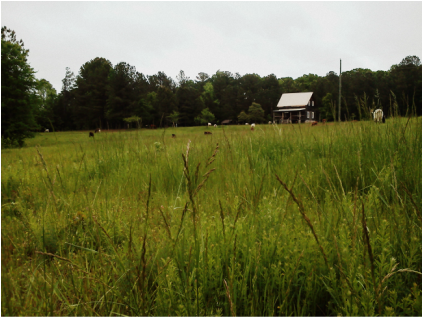 The farm was still occupied by Indians at time of Revolutionary War as most whites were still in the Broad River area. After the war, the Indians were forced out and ultimately removed entirely from the area (to Oklahoma). The gates were open for settlement of the still fertile land. The aristocratic Virginia settlers dominated the Carolina Acrackers who had smaller holdings. G. Pioneer Settlement Period (1784-1835). The first white owner of the farm was Holeman Freeman (received land Sept. 20, 1784 from John Houstoun, the captain, general and governor and commander in chief of Georgia). The grant was probably for 400 acres which was sold for 130 pounds in 1795 to Robert Smith who in turn sold it to John Colquitt for 200 pounds. The farm was identified as being on Golden Groove Creek. In 1793, Oglethorpe County was created out of Wilkes County. The new county seat was Lexington (1797). Tobacco was the main cash crop. The farm was a raw frontier. Over the next decades it is divided and sold but the larger portion of the farm (similar to today's boundaries) remained in the Colquitt family. Tobacco was labor intensive and the larger farms had slaves. Tobacco was cured in tobacco barns and packaged in hog's heads and shipped to Augusta by wagon. But the farms were truly pioneer and included cereals (maize, wheat, oats, rye, barley, flax) while vegetables and condiments were grown in kitchen gardens to support the families. Mixed animal husbandry was practiced (sheep, cattle, hogs, poultry, mules). Farms were self-sufficient for the most part. By 1815 there were some large plantations emerging in the county (John Billups was largest with 80 slaves and William H. Crawford's Woodlawn plantation). By 1830, however, farming was negatively impacting the land (clearing, soil erosion, silting, etc.) so much so that some local people called for a sustainable agriculture (Alexander Jones). H. Antebellum Period (1835-1860). Cotton became King thanks to the cotton gin and international markets. By 1835, there were 6,689 slaves in Oglethorpe County with 10.2 per farm household. Twelve farmers had more than 50 slaves. Black outnumbered whites in the county. The crops were: cotton, maize, oats, wheat, potatoes, and rye. The farm was never a large plantation with many slaves (if any) but there is little doubt that its main crop was cotton. By 1850s cotton was booming and the white tenant farmer class became significant. Crawford was the commercial center with a train depot. I. Post-Civil War and the Rise of the Yeoman farm (1865-1960). Emancipation of slaves changed the agriculture again. Former plantation owners, deprived of their labor, make tenant farmer arrangements with blacks and whites. Wealthly planters moved to town and increasingly engaged in commerce. Our farm mainly remained with its earlier owners with the family providing all or much of the labor. Some of the land was provided to tenants (mainly Blacks) who farmed on the shares (tenant shacks are on the original farmsteadBnot part of Agrarian Connections). Cotton prices fluctuated with high prices abundant after WWI. Tenant (sharecropping) was increasingly replaced by cash renters. During this period, soil degradation continued unabated. Soil conservation measures (terraces, rotations, etc.) did little to stop soil erosion. In 1921 the boll weevil arrived and this little bug, along with overproduction in the years before, brought about the decline of cotton. During the 1920s, 7,500 people left the county. Indebtedness and unreliable prices of cotton brought many to sell their land. Big timber companies moved into the county particularly during the Great Depression of the 1930s. The Roosevelt era saw the first subsidies to landowners. Mechanization increased and row cropping (mainly of soybeans) began. The county population went from over 10,000 people in 1940 to less than 3000 in 1960. Our farm was still a small-scale farm of mixed agriculture emphasizing row crops, some hogs, and cattle. By 1960, the cleared areas of the farm had been cultivated for almost 200 years while the timber areas had been cleared and then allowed to return to more mature forest.